Newly-promoted Kelso RFC is officially opening new changing rooms during a special family day at the club on Saturday. The occasion is intended to celebrate the launch of the new facility, as well as promoting the game among women and various young age levels. The Poynder Park improvments came about through grants of £50,000 from Scottish Rugby’s Club Sustainability Fund, £100,000 from sportscotland, £30,000 from BCCF Environmental (from money donated by Scottish Borders Council through the Scottish Landfill Communities Fund) and £30,000 from the Scottish Landfill Communities Fund through WREN. The cash has been used to transform their current facility, which was in need of a major overhaul, to make it fit for purpose and worthy of a top 20 club. Stewart Harris, chief executive of sportscotland said: “We work closely with partners right across the country to improve sports facilities as part of a world-class sporting system. 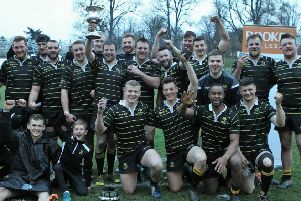 Kelso RFC had been an integral part of Borders life for generations. “By investing in its facilities, the club is creating an environment which will encourage more people to take part in rugby and ensure the legacy lives on. Terry Frame, Kelso’s immediate past president, believes there will be a real boost for all current and future players (both senior and youths), including the ladies’ team. Saturday’s fun begins at 10.30am with numerous attractions for the family. There’s a mixed range of rugby action, including mini. ladies and U18, as well as a 1pm game by a pre-season warm-up between Kelso and Hawick’s senior first XVs.